Because WordPress is one of the longest-running and most popular CMS, every major tool typically develops a WordPress plugin first. It’s sort of like how everyone develops for the iPhone before they develop for Android. For example, GatherContent (an awesome content management platform we use at First Page) has a WordPress plugin that completely integrates with your content production system so completed content is pushed from GatherContent to WordPress without a clunky download or any upload time. GatherContent does not have a SquareSpace plugin. Plugins for SquareSpace are limited to ones that are only built in the actual program. There isn’t an easier way for you to expand the functionality of your website otherwise. SquareSpace offers limited integration with selected services, and even those services have additional limitations. There are more than 11,000 WordPress templates out there. Some templates are free, while most are a small fee (average costs around $60). If you like the design aesthetic of SquareSpace’s modern templates, you can probably find WordPress templates similar to SquareSpace design style. The only difference is that the WordPress template likely has better functionality. 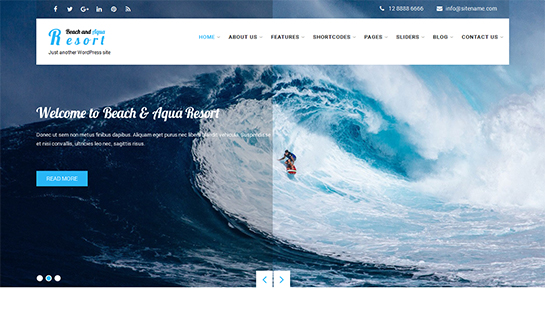 Below are three examples of WordPress templates that are similar to SquareSpace regarding the clean, modern design. Premade templates are one of the are one of the main reasons why WordPress is so easy to use. 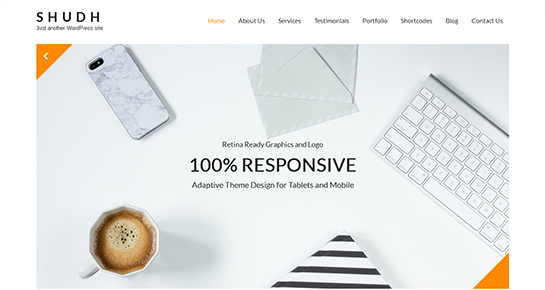 These templates allow you to easily change your header and images or add and move widgets on your website. The design of your website is usually 100% customizable, down to your blog layout, if you want two or three columns, colors of your background and fonts, and more. If you learn basic CSS and HTML, you can do even more. WordPress was originally created as a blogging platform, so the blogging capabilities are already built-in and easy-to-integrate. There are extensive opportunities to extend the functionality of your website with plugins (see point above). WordPress websites can scale as your business grows. You can add as many pages, and the performance of your website will not be compromised. Because WordPress is a self-contained system, it doesn’t require HTML editing software. All editing can be done within WordPress. WordPress allows you to optimize every aspect of your content such as setting a focus keyword, creating SEO-friendly title tags using the Yoast plugin, and more. Yoast is best in class for content optimization. You can also monitor at a quick glance all of the SEO ratings (green, yellow or red) for your content. Green means it’s optimized, yellow means you could do better, and red means you need to fix something now. With Yoast Pro, you can even do neat things like automatically set redirects for broken content. For all of First Page’s clients, we use WordPress with the Yoast plugin. In fact, it’s the first plugin we always upload. Default WordPress settings allow you to optimize unique meta descriptions. WordPress allows you to be creative and submit an XML sitemap. The sitemap can easily be submitted to search engine webmaster tools that allow you to tell Google and other SEO bots about what all exists on your site. And, you guessed it, WordPress has plugins to help you create those XML sitemaps. WordPress code is simple. This helps search engine bots to index your site easier. You must note, however, that installing well-coded themes and plugins ensure your website is high-quality throughout. Should You Use WordPress or SquareSpace? Overall, it’s about what CMS you’re going to feel more comfortable with to keep your website fresh and your content consistent. If that’s SquareSpace for you, then that would be your best option as long as you consistently create new content and consistently refresh your website. But, if you want the options to integrate with other software, add functionality without hiring a developer and get mega-powered SEO benefits, then it’s worth teaching yourself how to use WordPress. You could also hire an inexpensive WordPress developer from a website like UpWork, who can help support your website development efforts. Need additional support with setting up your WordPress (including categories, plugins and more)? We’re here to help.